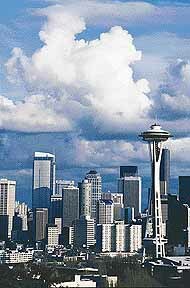 Seattle is Washington's largest city and the seat of King County. Lying along Interstate 5 between the Olympic Mountains to the west and the Cascades to the east, the city sits on a strip of land between Puget Sound and 18-mile-long Lake Washington. Those bodies of water are united by a system of locks and a ship canal feeding into Lake Union. Although early maritime expeditions sighted the Washington area before the close of the 1800s, Seattle was settled comparatively late. With a continent to cross, the first families did not reach the area until 1851, when they settled at Alki Point and later moved to Elliott Bay. Today Seattle, population 563,374, is the region's cultural, industrial, transportation, commercial and financial center, as well as international port of entry. The Boeing Company is here. The Space Needle is a famous landmark. Frequent rains keep the surroundings cleaner and greener than most cities its size. Seattle is part of the Seattle-Bellevue-Everett, WA metro area.